Laser diodes require a powerful, highly dynamic power supply for stable and precise laser system control in material processing. For the demanding requirements of these laser diode systems PBF’s high quality Power Supplies provide an extremely high energy density. Situated between grid and laser unit their dynamic load adjustment ensures optimum efficiency at fast dynamic pulse frequencies. This increases system performance and lifetime. 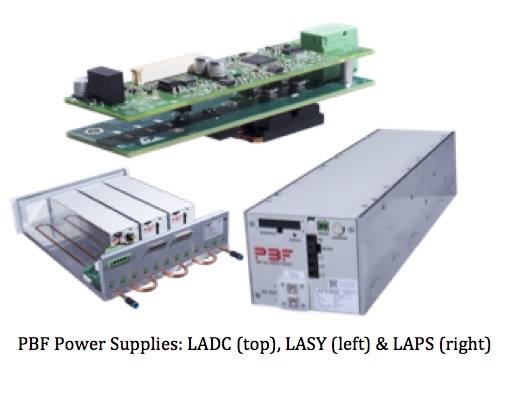 PBF Laser Power Supplies are configurable and scalable for a variety of different system loads and requirements. In addition to a range of technical add-on functions they feature decisive cost, quality, and service benefits. PBF used the unique, successful PBF Power Supply Platform Technology to customize the ordered laser power supply systems. Additional information on SFC Energy, PBF, and SFC Group’s portfolio of power electronics and power generation products at www.sfc-com and www.pbfgroup.nl. PBF Group B.V., a company of SFC Energy Group, specializes in switched mode power supply solutions and special coils. The Company is active worldwide. PBF develops, customizes, manufactures, and markets high quality power conversion solutions from simple power supply units to highly complex, customized power systems for top-level producers of professional machines and equipment.